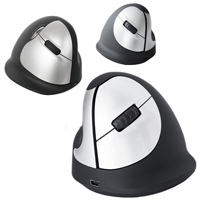 The Rockstick2 Mouse retains all of the benefits and functionality of the original Rockstick Mouse but introduces a new design and added capabilities. 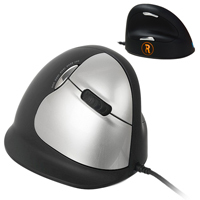 As with the original Rockstick Mouse, the Rockstick2 addresses one of the most repetitive activities of computer use--generating mouse clicks. Rather than using one or two fingers to click a button, the user simply rocks the body of the mouse, tilting it slightly to the left or right to generate a click. The strenth of the entire hand can be used to generate the click, rather than the much more limited strength of the index or middle fingers. 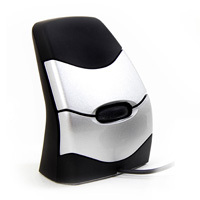 This makes the Rockstick Mouse2 a potentially good alternative for individuals with trigger finger or arthritis, or for anyone who has difficulty clicking the buttons on a conventional mouse. 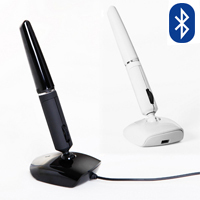 The new design is also ambidextrous, enabling both left- and right-handed users to experience the benefits. 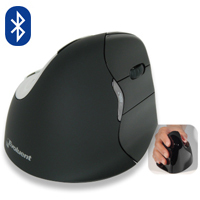 The scroll wheel is located on the inside of the mouse, where it can be accessed easily by the thumb. This newest model also features variable DPI and a flange to keep the little finger clear of the worksurface. Two size options (Small/Medium and Large) are available. 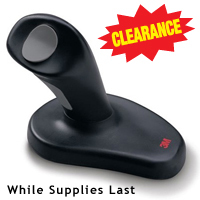 Note: The wired version of the Rockstick Mouse2 has been discontinued by the manufacturer. 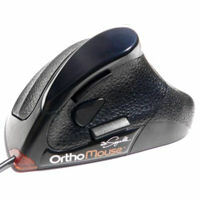 The 3M Ergonomic Mouse (formerly the Renaissance Mouse) features a unique, vertical grip design which largely eliminates pronation. 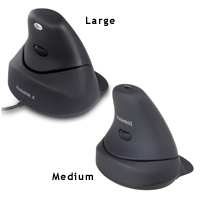 It is ideal for users who have limited articulation of their fingers and need to 'hook' their hand onto a mouse. 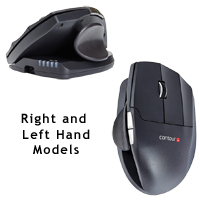 The mouse is for right handed users only and available in both a wired and wireless model. 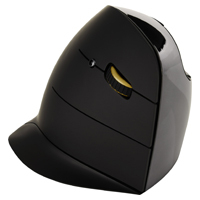 La 3M Ergonomic Mouse (connu auparavant comme la souris Renaissance Mouse) a une charactéristique unique qui est une prise verticale qui élémine la pronation de grande façon. Elle est idéale pour les usageurs qui veulent l'articulation minimale des doigts et qui veulent avoir une sensation d'accrocher la main sur une souris. La souris est seulement pour les usageurs(euses) droitier(ière) et est disponible avec fil, aussi quand modèl sans fil.